Well, it’s even more important to know the bitter side of bypassing iCloud Activation process using iCloud Bypass Tools. Not to worry, I have covered all of them in this article. It is a well-known fact that the iCloud is an official app of Apple that comes pre-installed in all products of Apple Inc.
Once you set up your iCloud account, the app prevents any unauthorized access to your device whenever it’s lost or stolen. The app synchronizes almost all the information available in your device to iCloud and secures it from any unwanted or unauthorized use. It’s a great way of securing your device even when it’s lost or stolen by someone. The app will lock up your device when you turn on “Find My Phone” option. You’ll also have to setup everything from scratch by entering Emails, Passwords, IDS, etc. Well, the process isn’t really time-consuming but can be hectic at certain times. Still, you can simply bypass iCloud activation by using iCloud Bypass Tools. Here’s our Top 10 list of Best iCloud Bypass Tools to bypass iCloud activation. Don’t forget to check out the Pros and Cons of each tool mentioned below. iCloudin is our top pick for bypassing the iCloud activation lock whenever you reset your device. The app is available for free to download on the web and it is compatible with almost all the versions of iOS. The app provides on-screen easy to understand tutorials for beginners, the interface is also simple and clean. 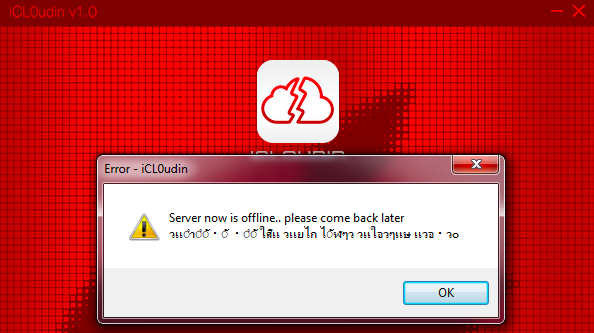 You can easily bypass iCloud Activation within minutes with the help of iCloudin bypass app. It’s a trustworthy app, so give it a try. Website tool is not responsive. It won’t take the exact shape of your device and that makes it clumsy. iPhone X, iPhone 8, iPhone 8 Plus, iPhone 7s Plus, iPhone 7s, iPhone 6s Plus, iPhone 6s, iPhone 6 Plus, iPhone 6. iPhone 5c, iPhone 5s, iPhone 5, iPhone 4s, iPhone 4, iPad Air, iPad Mini, iPad Pro. iOS 11.0.1, iOS 11, iOS 10.3.5, iOS 10.3.4, iOS 10.3.2 to iOS 10, iOS 9, iOS 8 and all versions of iOS 7. The name itself says what’s the app is all about. This one is the most popular and professional iCloud bypass tools in the market as of now. The app has received a lot of good reviews from those who have tried it. It’s a multi-purpose tool and serves a lot of functions. The app claims to be compatible with all the iOS versions, but we highly doubt that. However, it worked well with the majority of versions users tried. You can give it a try to remove or bypass the iCloud activation easily. Compatible with all versions of iOS including the latest iOS 11. Simple, Easy to use tool. Too much response time as this is a multi-functional tool. Running multiple tasks at once will cause drags on the screen. All versions of iOS 10, iOS 9, iOS 8, iOS 7. Support to iOS 11 devices has been added as most of the iPhones are upgraded to iOS 11. Doulci iCloud Removal Tool is one of the effective apps that can bypass iCloud activation process. The app has a 75% success rate in bypassing the iCloud activation system, so it’s worth trying out. It’s actually a powerful app, you just have to follow the online tutorials to understand the process of this app. With over time, you will become familiar with this app. Download the app right away without any hesitations. Very easy to use on any iOS device. Compatible with almost all versions of the iOS operating system. It has an instant support that will help you when you get a problem while bypassing the iCloud verification. You should go through a survey to download the file. Don’t worry, you can bypass surveys online in less than 1 minute. The response time of the tool is relatively high compared to the other tools to bypass iCloud verification listed here. All iPhones except iPhone 3gs and older devices. All child versions of iOS 11, iOS 10, iOS 9, iOS 8 and iOS 7. Incompatible with iOS 6 and older versions. GagdetWide is a common app used for bypassing iCloud activation screen. It’s actually one of the highly rated iCloud bypass apps in the market till date. The support option is one of the great features of this app. Whenever you get stuck anywhere in the process, just use the support option to get online help. Apart from that, the online tutorial section is also quite helpful. You can use this app to unlock your iPhone with ease anytime and anywhere. In case you forgot the passcode of your iDevice, Gecko iPhone toolkit helps unlock and reset your iPhone if needed. Incompatible with older versions of iOS. All iOS versions except older than iOS 7.
iCloud Easy Release Tool isn’t a powerful one compared to the other iCloud unlock apps/tools mentioned here. However, lives up to its claims in unlocking the iPhone devices. It takes around 10 minutes for this app to complete the process of bypassing iCloud activation system. So, if you are okay with the waiting time, then go ahead and try it out. But as I said, it really works (most of the time) and features a simple easy to navigate interface as well. Pre-configured settings and modes will help you in faster completion of bypassing iCloud verification process. The software is only available for Windows machines and it won’t work on Mac machines. Sometimes it will take time than usual (more than 10 minutes). iPhone 4s and iPhone 3GS (Not Supported), iPhone 5s, iPhone 5, iPhone 5c, iPhone 6, iPhone 6s, iPhone 6 Plus, iPhone 6 plus, iPhone 7s Plus, iPhone 7s, iPhone 8s Plus, iPhone 8s, iPhone X.
iOS 11 and it’s child versions (Exclusive), All subversions of iOS 10, iOS 9, iOS 8, iOS 7. Earlier to iOS 7 is not at all supported. iPhone Unlock Tool is another great app for unlocking any iOS device. Well, this is not an app actually, in fact, it’s a service of iPhone unlocking. The app comes with a hefty price tag of INR 1,200 ($20), but it does work and stands on its point. The app doesn’t bypass the iCloud activation, it actually uses your IMEI number (stored in the database of Apple Account) to unlock your iPhone. You can try out this app if the other mentioned apps aren’t working for you. No Lags, No Drags, No complications. Works well in unlocking your iOS device. The service has a very good trust and decent rating. It won’t bypass the iCloud activation process. 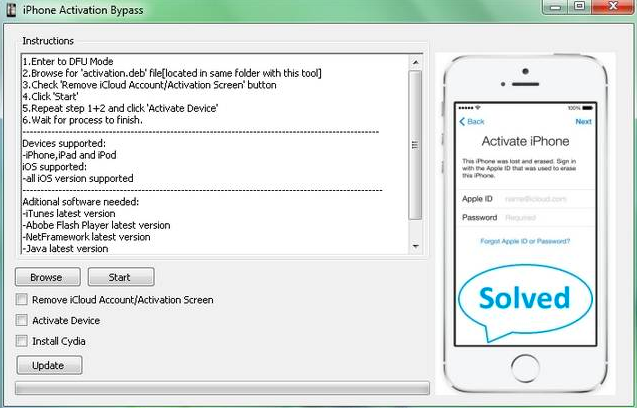 iCloud Activation Bypass Tool Version 1.4 is easy to use tool for bypassing iCloud activation system. Once you download the tool, it connects you to the servers of Apple straight away. From then you can use the app as needed to bypass or skip the iCloud activation process. In case, if you get stuck any moment, you can use their support system to contact customer support and get your issue rectified. It’s one of the Best iCloud Bypass Tools out there. Efficient yet very easy to use. No In-App Purchases at all, LocaliAPStore will help if you come across any. Response time will be high sometimes. Open My iCloud is an advanced tool for removing or bypassing iCloud activation. The app offers extremely simple process to unlock your iOS device. All you have to do is just install the app, open up and give necessary details or permissions. The app unlocks almost all the iOS versions with just a single tap. It may hardly take you around 10 minutes to unlock your iPhone if you follow all the instructions properly. Installation and using are super simple. It will bypass the iCloud authentication in under 10 minutes. It won’t remove the iCloud verification completely, it just bypasses on some iOS devices. The name itself says everything about this tool and its functionalities. This tool’s website provides 100% support service to its users. With the help of online walkthrough tutorials, you can easily understand the process of bypassing the iCloud activation process. Well, the ratings for this app aren’t that high compared to other apps, but there’s no harm in giving it a try. Just use the website if you get lost in the process of unlocking your iPhone. Alternate Way: You can unlock any iPhone device via DNS method. In order to use this method, you need to have some details of the owner of the device. Head over to the Settings, open up the Wifi Option then hit “i” which is next to the Wifi network you are connected. You will find the DNS address there, just remove it and apply the below codes according to your location. After saving the new DNS, just tap on the “Activation Help” to complete the process. Those are the Top iCloud Bypass Tools to Bypass iCloud Activation Lock for free. Each tool has it’s own advantages compared to the other one. Let me also know if you have come across any other tool of this kind, help us mention that in this article. Show your love by sharing this awesome list with your friends, Thank you.